Additional Projects. The number of articles that can be made from plastics is practically limitless—anywhere that its brilliant colors, finish and easy workability or any of its other many features fit in, provides another use for plastics. 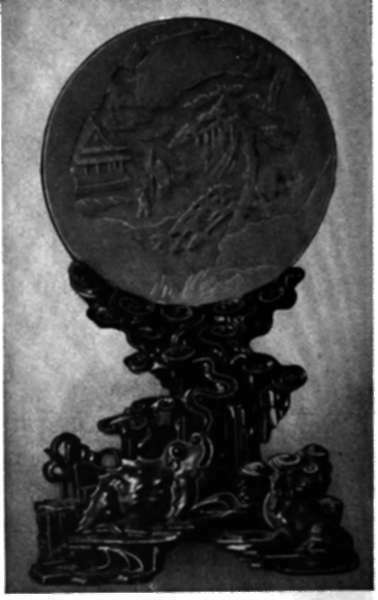 PLATE 3Y. The turned cigarette-box described in Project 33, and a few more plain turned bracelet in mottled material. This project provides exercise in boring, lace-plate-turning, turning between centers and cementing. PLATE 3z. (Left). 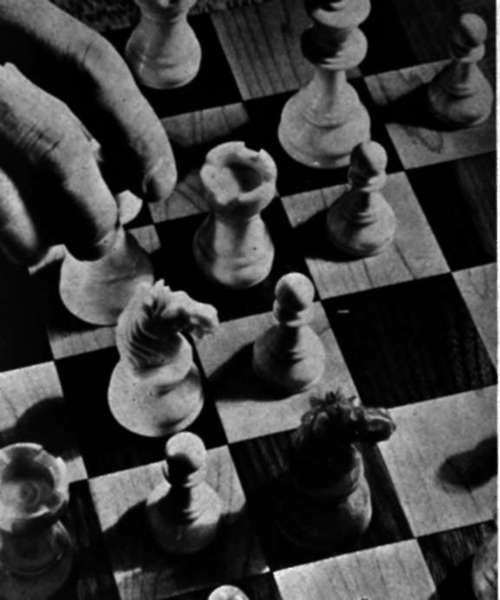 The plastic chess-set, with all the beauty and finish of ivory, described in Project 35. PLATE 4B. 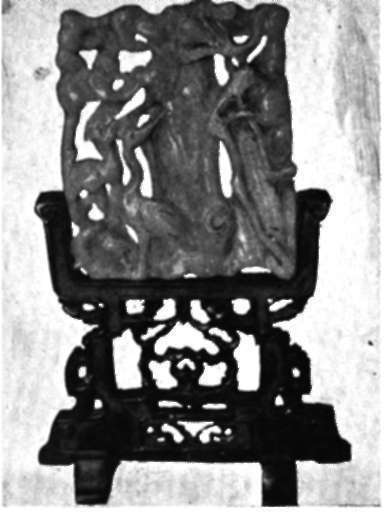 (Lower left) the finished copy of the carved Chinese Jade screen from Brooklyn Museum, described in Project 38, and PLATE 4A. lower right) photo of an-other object in the same collection offered as a suggestion for simplification and copying. Fig. 64. The vanity set described in Project 61. The bass is made ap ef plastic sheet, or alternating sheets of plastics and wood. 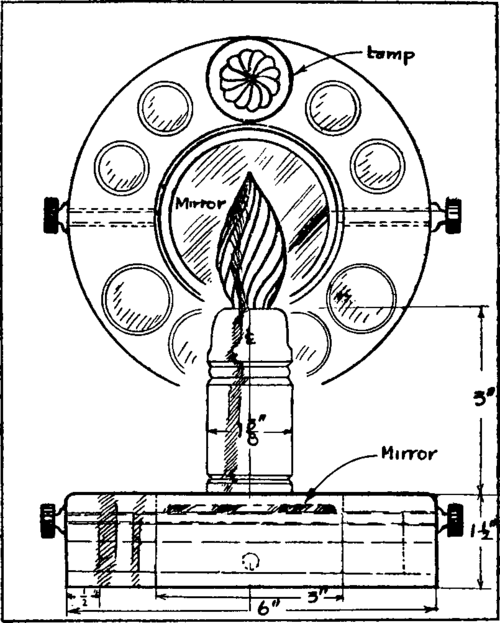 Various cosmetic bottles, lip-stick, etc., are set into the holes around the rim, and either a shaded or frosted ornamental bulb serves to light the face, which is reflected In the adjustable mirror below. 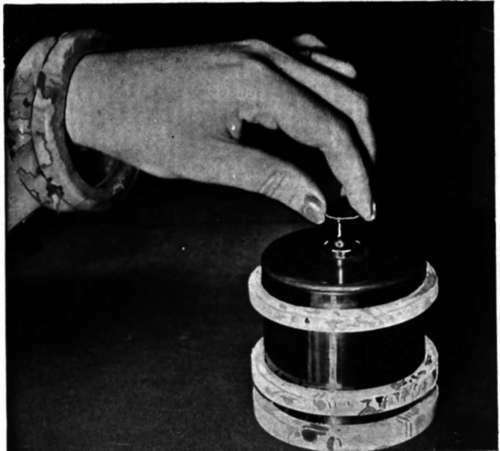 Some that might be suggested, covering fairly simple projects, are dice-cups, made from a short section of medium-sized cylinder with a bottom cemented in; batons for orchestra-leaders; checkers; curtain-pulls; cigarette-lighters; see Plate 4F; door-knobs: see Plate 4G; lockets; miniature statuettes carved; backgammon and other game boards and pieces, and so on. "Extemporaneous" Designing Contemporary homecraft literature is full of designs and projects featuring plastics, either as the main or incidental con-stitutent of the design, and it is not hard for anyone to find a project that appeals to his particular taste. But the writer, and no doubt hundreds of other craftsmen, has often been tempted to branch off in the middle of a project into something else entirely different, when struck by some particular combination of colors and shapes when working with this material. The material lends itself so readily to variation in design and creation of new designs that it is difficult to hue to the straight and narrow path. These comments, then, deal with variations alone, letting the blue-prints fall where they may. We were making up a flock of bracelets for Christmas; one evening in our homeworkshop; they were all sizes and shapes and colors—rose-quartz, amber, amethyst, ruby, emerald, turquoise, and so on, scattered on the bench, finished and polished, and a few powder-boxes with them. In the rough, they were all just sections of bracelet-cylinder, in two sizes, one with the quarter-inch wall and one with the half-inch wall both of the 3 1/8 inch inside diameter. It was the tail-end of the evening, things were slowing up, and we started playing with the bracelets and cylinders, combining and comparing the various colors and shapes, until suddenly the idea struck us that these things were nothing but building-blocks—units out of which we could design and construct an unlimited variety of objects-de-homecraft-art. The photos herewith Plate 4H, are some of the results of these casual experiments. Unquestionably, a little more serious thought would produce even more striking effects, but they serve to illustrate clearly the principle we have in mind—that designing in plastics is an entirely different process from designing in any other materials—you have your finished shapes and colors before you—just stack them one upon the other, try this and then try that, and you can see definitely and immediately what your finished product is going to look like. In this way you can guard against disappointments on something you have worked long and hard at without being able to visualize clearly in advance what it was going to look like when you finished. Take the lamp made from the large "random-color" cylinder for instance. At least a half-dozen different combinations of bases and tops were tried before the one shown was determined upon—yet the entire job of setting up and deciding upon these six different combinations took less than five minutes altogether, and we were able to see just exactly what the finished product would look like, because the parts used in testing were finished parts. The same applies to the cigarette-boxes, the powder boxes and the ash-trays—our coloring and the figures in the material were already done for us in the vulcanizing ovens of the plastics company the brilliant final finish had been put on with a buffing wheel, the colors we do not choose to use in the lamps or boxes still made beautiful bracelets, or could serve a dozen other uses, so nothing was wasted. Compare all this with the process you would go thru with wood or metal in achieving similar results. It is a good idea to have quite a stock of different sizes and colors and cylinder and sheet always on hand. It is impossible of course to have a complete line so that you can instantly make up any idea you get, but you will soon find that even with only a half-dozen colors, using the method outlined above, you can always find two colors that harmonize well and make up into a beautiful design. The exact color you choose in plastics is not always so important, as its beautiful finish makes practically any color attractive. Plastics is particularly suitable for use in lamps as the light is picked up by the translucent material and they seem to glow with life and warmth.